There’s a rather beautiful piece in The Avengers: Age of Ultron where the Vision confronts the last incarnation of Ultron. The latter has a pretty grim view of humanity, and the Vision tells him, “A thing isn’t beautiful because it lasts.” It’s a lovely sentiment, and I think says a lot about our place – indeed, everything’s place – in the universe. This has started to get very philosophical, so I’m going to talk about chocolate now. It’s a natural progression. Let me take you back to March 2007. 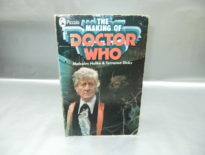 The Doctor was about to meet Martha Jones and be transported to the moon, where he’d be chased around by giant rhinos, accidentally destroy his sonic screwdriver, gallivant around bare-foot, and have his blood sucked by an OAP with a straw. Happy days. That month, it was Red Nose Day: for international readers, that’s a charity event for which UK citizens don squidgy red noses. You’ll know that particular year in question for its Catherine Tate Show sketch starring David Tennant as a teacher who looks spookily like that Time Lord off the telly. 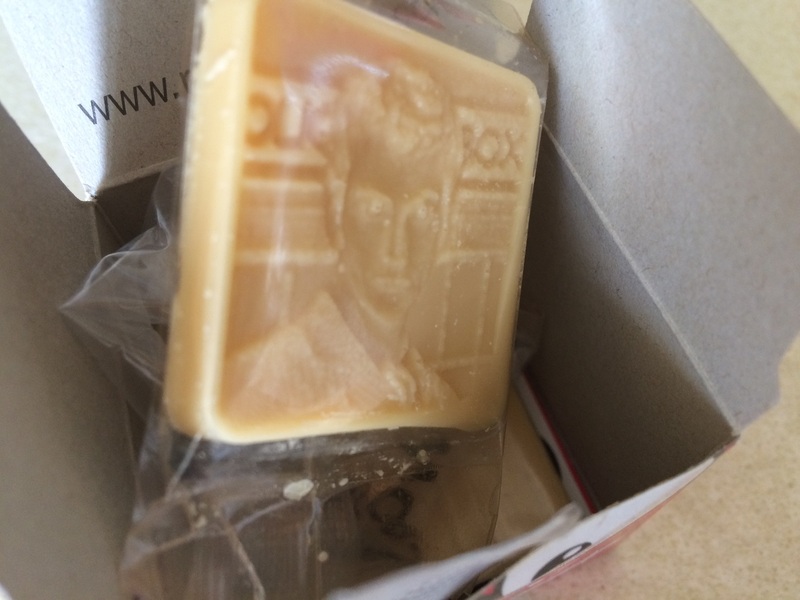 Also, his face was immortalised in chocolate. Given it was chocolate, that immortality was as ever-lasting as you might hope. Y’see, to sell more red noses than ever before, there were gimmicks. 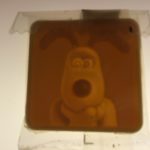 2007’s gimmick was collectible bits of white chocolate, packaged with the nose in the hope that everyone would go mad and buy the entirety of Sainsbury’s warehouse. 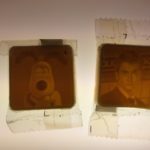 Collectible chocolate sounds like an oxymoron, but the event organisers were clever: they used franchises they knew fans would obsess over so much, they really would collect, collect, collect. 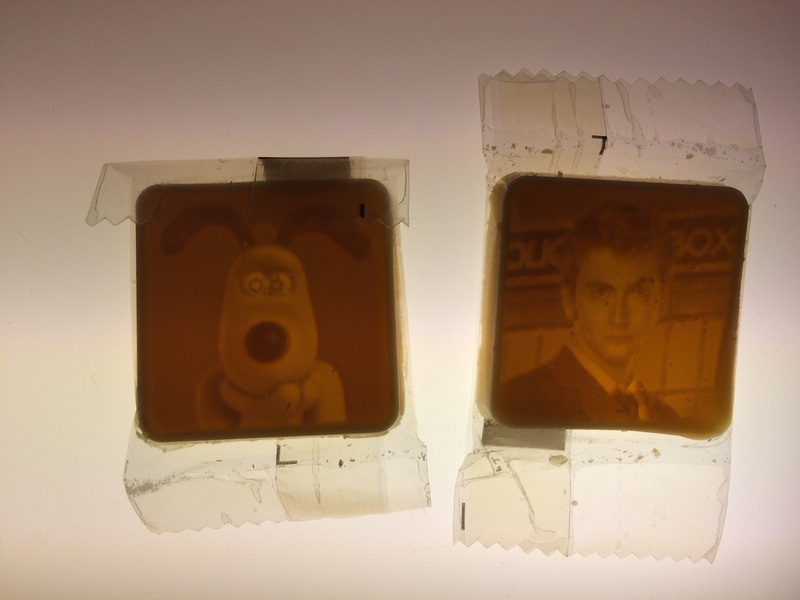 These franchises were Doctor Who, and Wallace and Gromit. Living near Bristol, the latter is dear to me too. I bought a nose. 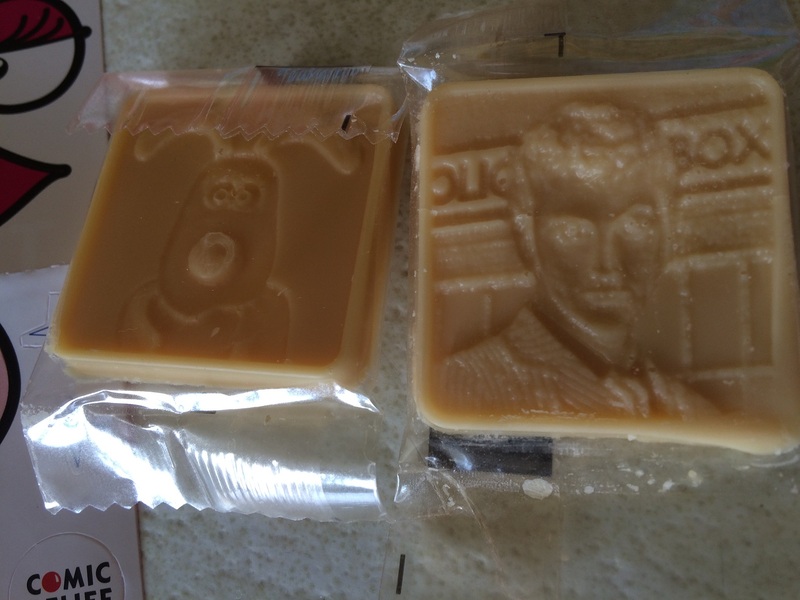 I got one chocolate from each franchise. Wonderful. Naturally, I chortled at them, ate the chocolate, and got on with my life. … By which I mean, that didn’t happen. Nearly ten years on, I still have the chocolates, preserved in the Red Nose box. This seems one of those obsessive thing only nutcase fans would do. And it is. And I don’t care. You hear of people who have kept the most insane of things in pristine condition: Tom Baker underwear, the Berwick Dalek playsuit, a packet of Bird’s Eye fish fingers. This is one of my rare forays into that arena. When I bought it, nine years ago, I thought it was pretty cool. I still do. This is a creation by Chocpix, a great company that produces designs in multiple layers. 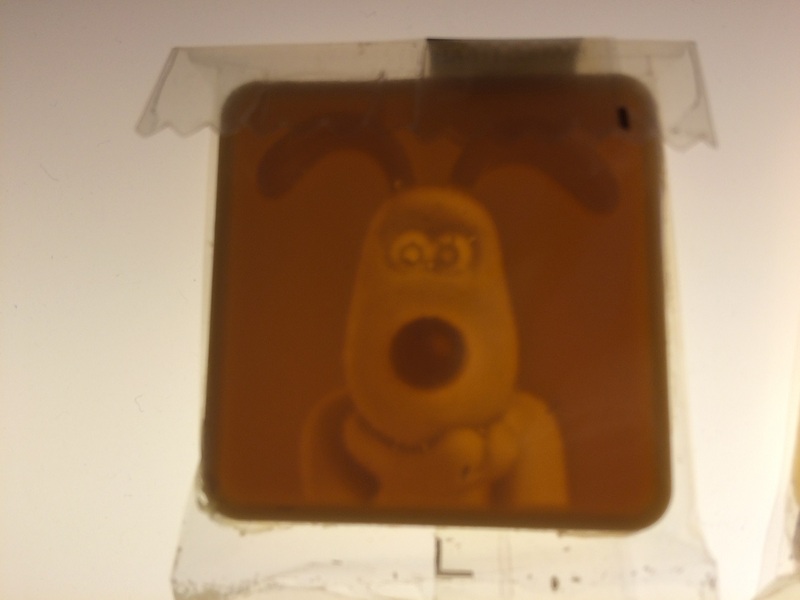 These are chocolate that make 3D pictures. 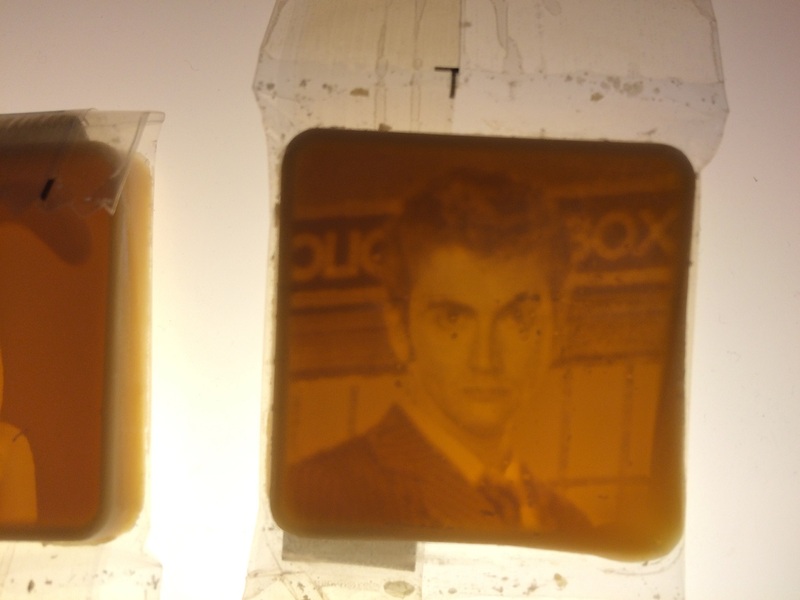 You can see the design when they’re flat against the surface, but hold them up against a light and the image shows itself properly. See, how awesome is that?! I’m under no illusions: I won’t still be looking at them in 20 years’ time; I know they won’t last, but as we’ve already gathered, something isn’t special because it lasts. It’s a reminder of an era, something I very much doubt many people own anymore. 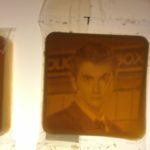 And I feel that capturing it now, presenting it on a site for dedicated obsessives like myself, it will not only be appreciated for what it is, but also might appear on one of those “Top 10 Weird Bits of Doctor Who Merchandise” articles in the future. With a Best Before date of October 2007, it’s not like I’m going to eat it now, is it? 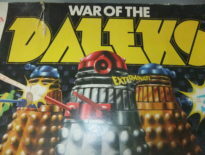 Memorabilia	War of the Daleks!